Fareed is a citizen journalist in the city of Ma’arat al-Num’an in Idlib Province in northwest Syria. Since the morning, Assad’s forces have started shelling cluster bombs on the southern Idlib countryside. The first city was Khan Sheikhoun. [Then] at 1:20 the shelling began on the city of Ma’arat al-Nu’man. People started running down the streets to hide from the shelling. My sisters and children in school — I was very afraid for them. 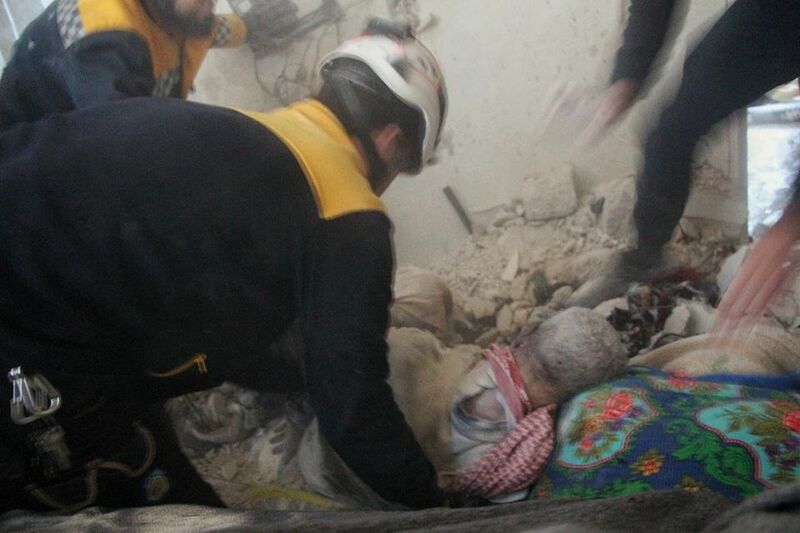 The ambulance began to rush to the bombing sites to save children and civilians. I went to the bombing site to document and photograph the location of the shelling. When I was there, an observer said there is a rocket in the sky. I ran and ran awa. The rocket landed 500 meters away from me. My legs no longer carry me with fear. Finally I went to my workplace and took a break. There were many dead and wounded civilians and children. We were afraid of cluster bombs falling on us. Now I am very tired. Today was very difficult from the severity of the bombing. I’m going to sleep for comfort. Please everyone pray for us. I am praying for all the innocents of Syria.